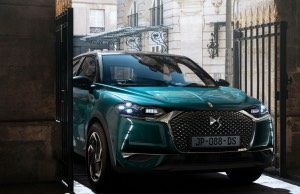 The kooky yet wonderful DS3 Crossback joins the Scheme, think of it as a DS version of an Audi Q2, expect diamond shapes, big comfortable seats, lots of wow factor and handles that pop out when you approach the car. The DS 3 Crossback certainly looks rather different to the small SUVs it competes with, with bold details and lots of unconventional bulges and creases. Perhaps the most unconventional bit is the ‘shark fin’ – a small piece of bodywork that raises up behind the middle widow pillars. 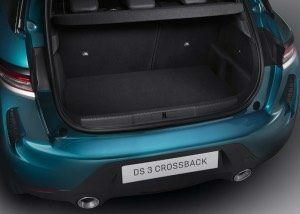 From a practical approach the DS3 Crossback has plenty of room upfront but the large front seats do eat into the room for rear passengers where legroom is not generous. The 350 litre boot, placies it on the small side of the class, Nissan Juke 355 litres, Audi Q2 405 and MINI Countryman 430 litres. Trim lines start with the Performance Line, through Prestige and onto Ultra Prestige. For a limited period (September 2019) there is the chance to bag a ‘La Premiere’ model. Performance Line models have 17 inch black alloy wheels, a 7 inch touchscreen infotainment system with Apple CarPlay and Android Auto connectivity, reversing sensors, keyless start, door handles that pop out when you approach, lane-keeping assistance, emergency braking and speed limit recognition with cruise control, part-Alcantara suede seats, tinted rear windows, LED rear lights and aluminium pedals. Prestige versions add front parking sensors and a 10 inch dash mounted touchscreen, built in sat nav, automatic air conditioning and leather seats. Ultra Prestige has 18 inch Alloy wheels, blind spot detection, reversing camera, head-up display, keyless entry, heated/power front seats, LED headlights/daytime running lights and nappa leather seats. La Premiere gives you the full cocktail bar experience with brown nappa leather seats and dash along with active cruise control and 18 inch black alloy wheels. The only engine presently is a 1.2 litre 3 cylinder petrol with 100, 129 or 153bhp, the 100 is manual only, the 129 and 153 outputs are fitted with the EAT8 proper automatic gearbox, no more to PSA cars suffer from the dreadful semi automatic gearbox. The 100 version is the only way to have a manual car at the moment and it copes well around town but is noisy when pushed, as is the way with three cylinder engines. The 129bhp version manages a respectable 9.2 seconds for the 0 to 60mph sprint, with the 153 version managing the sprint in 8.2 seconds. Fuel economy figures are 46.0 miles per gallon for the 100, 42.2 for the 1329bhp auto and 41.7 for the 153bhp auto.